You know that visiting your dentist near Allentown twice a year is important for protecting the health of your teeth and gums. Did you know that it is also important for an oral cancer screening? It is estimated that more than 49,000 Americans each year are diagnosed with a form of it. Sadly, only a little over 50% will survive more than 5 years. The low survival rate is attributed to late detection. Thankfully, you can have a simple screening during your next routine appointment to look for early warning signs. April is Oral Cancer Awareness month, which is dedicated to raising awareness to the importance of oral cancer screenings and your risk factors. Although many believe that routine appointments are only necessary for a cleaning and checkup, they also allow you to undergo a regular screening to look for cancerous and precancerous cells. Now, you have another reason not to skip your next dental visit. Gender:Men are twice as likely to develop oral cancer than women. 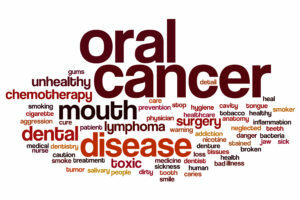 Age:Of those diagnosed with oral cancer, two-thirds are over the age of 55. Tobacco Use:80% of those who develop the cancer are tobacco users. Alcohol Consumption:70% of those who drink alcohol in excess develop oral cancer. Human Papilloma Virus (HPV):25% of those with oral cancer are infected with HPV. Genetics:If you have a family history of the cancer, you are at a heightened risk for it. Irritation or sores in the mouth that do not subside. Red, white, or rough patches. Lumps or thickening of the skin. Difficulty chewing, speaking, or swallowing. Abnormalities to the alignment of your teeth or your bite. If an unusual area is found, a tissue sample will be taken, which will be sent to the lab for testing. If the results are abnormal, you will be instructed as to what to do next. It is estimated that 80% of new oral cancer cases are detected by dentists. Now, it is more important than ever to maintain your dental appointments. In addition to a cleaning and checkup, you can get an oral cancer screening for early detection and treatment. Dr. S. John Salivonchik is a well-respected dentist in the community. Due to his extensive training, qualifications, and experience in the dental field, he has appeared on many major news programs. With a mission to provide superior dental care, he offers many areas of specialty, including cosmetic dentistry and dental implants. With a focus on prevention, he helps his patients reach and maintain their oral health goals. During your next cleaning and checkup, he will perform an oral cancer screening. If it has been more than 6 months since your last visit, contact our office today.